According to the Population Research Bureau, the best guess as to how many people have lived on earth is 108 billion. I don’t handle death well; funerals turn me to jello. Working in the hospitality industry I’ve run dozens of “celebration of life” ceremonies. Without exception I find myself weeping for people I didn’t even know. I busy myself by setting aside plates of food for the distraught family, or giving orders to my staff. I have an arsenal of tricks up my sleeve to drown out the testimonials and stories. The oddest thing is; I love cemeteries. Pere-Lachaise in Paris is considered the most visited cemetery in the world next to Arlington. We arrived at dusk, just before closing on a cold December evening. I was certain my husband and I were the only people there. Undaunted we set out; Chopin, Edith Piaf, Oscar Wilde; around every corner monuments to remarkable people. Signs pointed in the direction of famous graves but my attention was drawn to the lives of those I didn’t know. Inscriptions etched in stone all that remained of thousands of hopes and dreams. Tidy graves adorned with fresh flowers contrasted by crumbling markers of those no one remembered. With daylight long gone and danger of falling into sunken graves a consideration, we walked up one last hill. 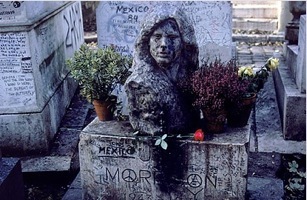 A security guard stood watch in a clearing; it was the grave of Jim Morrison. A woman sat beside the marker, after a moment she looked up and spoke to us. She was American, and told us this visit had been a life long dream. She seemed so sad, her despair haunts me to this day. Cristobal Colon cemetery in Havana houses over 2 million souls. Arriving at closing time, we paid a guard to let us in. Appointing himself our unofficial tour guide, we wandered for two of the happiest hours of my life. Somehow his lack of English and our lack of Spanish found a middle ground. So many stories; the grave of the woman buried with her dog, who stayed by her side for 10 days after she died. The world Domino champion, who he proudly told us was a woman. Musicians, writers, politicians, nestled amongst people whose only legacy was the marker on their grave. Cemeteries are more poetic than any book you could read. They have substance and meaning; the place you need to go if you truly want to learn about the places you visit.